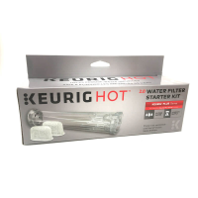 Filter your water for an even better tasting beverage from your Keurig brewer by using the 2.0 Water Filter Starter Kit. Simply assemble and insert into the water reservoir of a Keurig Plus Series (2.0) brewer. For use with Keurig Plus (2.0) Series brewers (excluding Keurig 2.0 K200/K250 brewers). Not compatible with Keurig Classic Series Brewers. For use with Keurig Plus (2.0) Series brewers (excluding Keurig 2.0 K200/K250 brewers). Product not compatible with Keurig Classic Series brewers.